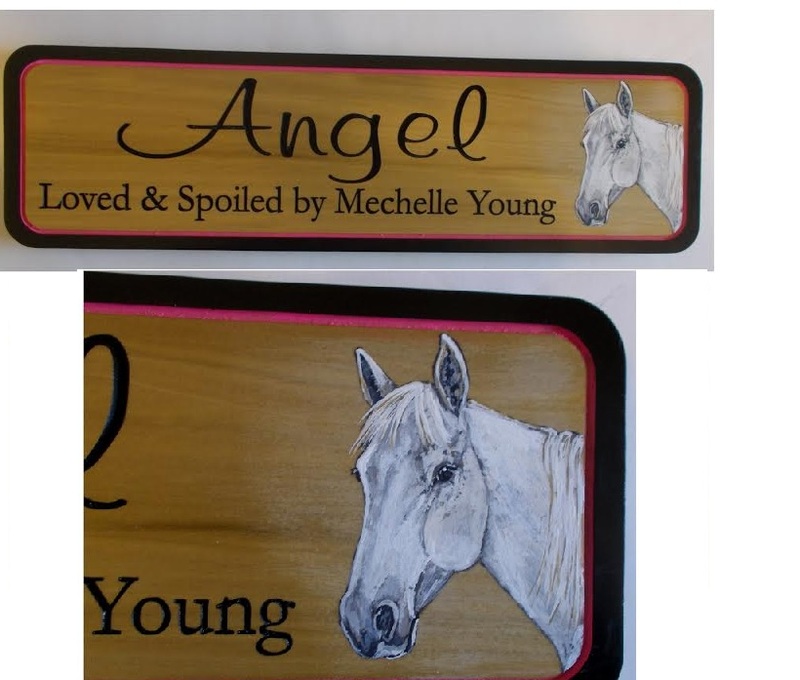 With so many options available, here's an opportunity for you to create a unique sign including a painted likeness of your own horse for your barn or for shows, and get exactly what you want. These great looking signs are hand-routed from solid wood, painted and sealed with an exterior water-base sealer. If your horse is a dark color, we'll make the background wood stain a little lighter, for contrast. Lighter colored horses will be done on a little darker background. Size is 5"H x 18"L x 3/4" thick. Your horse's head/neck will be expertly painted from the photo you submit, so a good headshot of your horse will be required. If you wish to have a bridle or halter included, we can do that for slightly more. I will contact you after your order is complete to have you forward your photo via email. You may even include a logo if you wish - your ranch's logo or perhaps your riding group's logo, for slightly more. Just indicate below that you might like to add it. The price will depend on the detail in your logo. Please select a font style for each line on the sign. Your sign will be laid out and a proof of the design will be emailed to you for approval. At that time, we will discuss any changes, before the sign is actually cut. Please allow 4 weeks for process from order placement to shipment. Price shown includes 2 lines of text. 3rd Line may be added for slightly more. This company is so awesome! You will not be disappointed. They were so accommodating for me as I had many requests all the way through! rnThis sign is sooooo beautiful! They captured my horse perfectly!I simply LOVE IT! I have already ordered another one for my new horse! I cannot say enough about how happy I am with them. Be patient. It takes time to make this amazing sign. That's how much they put into it. So worth it!Everyone at my stall loves it! Preetiest one they have ever seen. Thank you again for EVERYTHING! Thank you so much! I more than approve! That's the best stall sign I've ever seen in my life. Thank you so much! Great craftmanship, and painting beautiful! The communication when purchasing was outstanding! Will definitely buy more from this website!! The painted stall signs are gorgeous, and well worth the wait! I absolutely love mine.